The 1938 British Empre Games were held in Sydney, New South Wales in Australia from 5–12 February 1938. They were timed to coincide with the celebrations of the foundation of British settlement in Australia exactly 150 years before. Venues included the Sydney Cricket Ground (the main stadium), the Sydney Sports Ground, the North Sydney Olyumpic Pool and Henson Park. An estimated 40,000 people attended the opening ceremony. Continuing the tradition of the athletes village established in Canada eight years earlier, a competitors’ residential village was established within the grounds of the Sydney Showground. Due to the onset of the Second World War, the games were not held again until 1950. Ten countries took part – Australia, Bermuda, British Guiana, Canada, Ceylon, England, Fiji, India, New Zealand, Northern Ireland, Scotland, South Africa, Southern Rhodesia, Trinidad and Tobago, Wales. The countries in bold are those that won any medals at all with the top nations being Australia (66), England (44) and Canada (40) while Scotland was eighth with just five medals – two silver and one bronze. In athletics there was one solitary silver – won by David Young in the Discus Throw with a best 43.04 metres – 1.71m behind the winner. It was the smallest ever Scotland squad up to that point – there was one sprinter, two distance runners and one field events competitors. The sprinter was Margaret Marie McDowell from Ardeer (SWAAA 100 yards champion in 1937 and again in 1939 + 220 yards champion in 1937, ’38 and ’39) who fourth in Heat three of the 100 yards, and fifth in the second semi-final of the 220 yards. The middle distance runner was Bobby Graham who was 5th in the second heat of the half-mile and so did not qualify for the final, and then he did not finish in the final of the Mile after recording 4:18.8 in his Heat. He did not start in the Three Miles where he was entered. The long distance runner was the wonderful Donald McNab Robertson (second in the 1934 Games marathon) who was fourth in the marathon in 2:42:40. The Glasgow policeman David Young was the only field events athlete to represent Scotland and he was the most successful of the four there – second in the discus salvaged some pride with a silver medal although even he did not compete in all that he had been entered for – he was a ‘dns’ in the shot putt. He was SAAA Discus champion in 1937 and 1938 and then again after the War in 1946 and 1947). Robertson and Young were both in action on the second day of competition – Monday, 7th February and their events were written up as follows by the ‘Glasgow Herald’. “D McNab Robertson (Maryhill Harriers) who carried Scotland’s hopes in the marathon, an arduous 26 miles test, could only finish fourth to JL Coleman (South Africa) who won in the really fin time of 2 hours 30 min 49 8-10th sec. There is no official world record for this race, but Coleman’s time was within a minute and a half of K Son’s (Japan) Olympic record time. 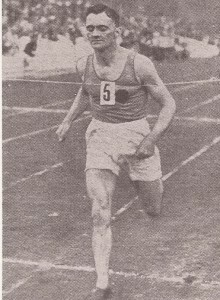 A Norris, the Polytechnic marathon winner, ran a splendid race to finish second and will win a great deal of satisfaction from the race in beating his old rival Robertson.Norris has also the satisfaction that even had he run as well as he has ever done in his life he would still have been several minutes behind Coleman’s time. Robertson’s performance however – his time was 2 hr 42 min 40 sec – was particularly praiseworthy as he had been suffering from a poisoned finger, which he had lanced on Sunday, and also found the extremely hot sun which streamed down throughout the race particularly exhausting. The heat was however particularly relished by the South African runners, Coleman and HA Gibson who took third place. However Scotland gained some consolation in the discus event. David Young, Scotland’s champion discus thrower, took second place in this event. His best throw of 141 ft 1 3/4 in was 4 ft 1 1/2 in better than the previous record set up at the 1934 Games by H Hart of South Africa. A new record however was made by the winner, Eric Coy the Canadian thrower with 146 fet 10 1/2 in. Hart’s record was beaten by both men with their qualifying throws. Young was followed by G Sutherland (Canada) who took third place with 136 ft 01/2 in. “Graham was content to take second place in his Mile heat. Unextended he came in second to the Welsh One Mile champion, Alford. After a slow start, Graham, whose best Mile time is 4 min 12 sec, or 0.8 sec quicker than the Games record set by J Lovelock in 1934, quickly took the lead. He was followed by F Barry-Brown, the Australian, with Alford lying third. At the half-way Graham was still striding away effortlessly in the lead. The order was unchanged except that Allen had dropped to sixth. Now Alford overtook Barry-Brown without difficulty and lay a close second to the Scottish champion. With a quarter of a mile to go the Welshman speeded up but Graham did not respond to the challenge. He was content to qualify. Alford passed him at the beginning of the straightand went on to win by 10 yards in 4 min 17 3-10th sec. Graham was four yards ahead of Pullen who took third place. The Mile final was on the last day and the report merely said that Graham disappointed. After setting a fast pace he lagged behind and did not finish. There was no word about whether he had been injured, ill or otherwise disadvantaged by fate.